The battle of all battles and I am loosing; big time! I haven't been able to post for more than a month. Ideas I have, a lot! There has been a lot of wine; events I attended and loved; even food I cooked, ate and enjoyed alone or with friends! What I'm lacking is TIME and maybe a whole lot of discipline. The first, I can't fight; I don't think anyone can. The second...no comment... Discipline and I are complete strangers; I could not describe how it feels, tastes or smells even if my life depended on it! My posts are getting fewer and fewer every month and despite my best intentions it seems I'm going to have to settle. I hate "settling" as much as I hate change - a bit of a contradiction here, I know. Yet another issue to be discussed by me and an army of licensed professionals!! Come to think of it, though, settling seems to be the devil child of the ever-hating change. Does it make any sense No? OK! I won't argue any more. Too much precious energy wasted on "could have-beens and-dones". I admit defeat and move on. One to two posts per month until things change .... again...oooof does it ever stop?? To sweeten the pill and make you forget my previous ramblings I am going to share with you a very special recipe. 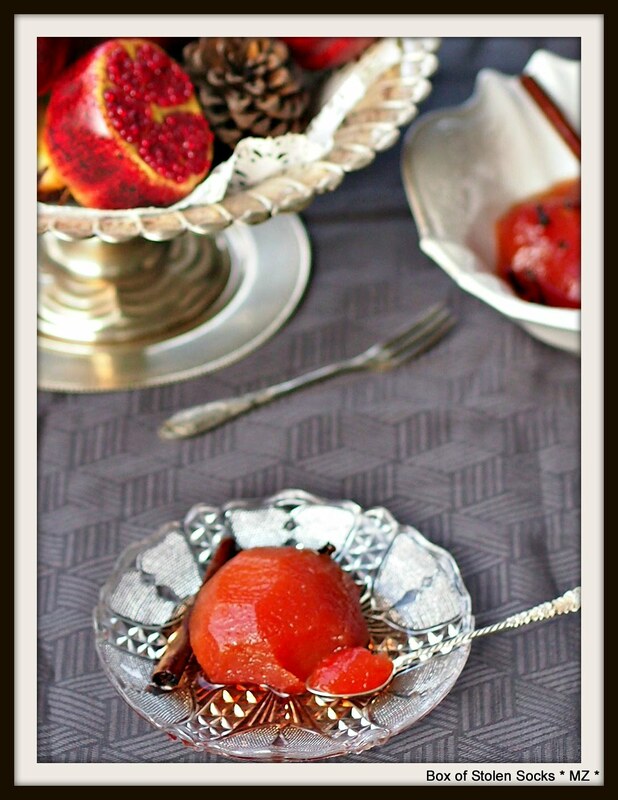 I am not sure if it is still Quince season where you live (if not, you can pin it and make it when you get your hands on some nice quinces!!). Here in Athens we seem to have a lot available at the moment. For the past few weeks my M-I-L has been making this extra special desert for us. Pay attention please. Quince, cooked long and slow in sugar and spices. It simply does not get better than this... 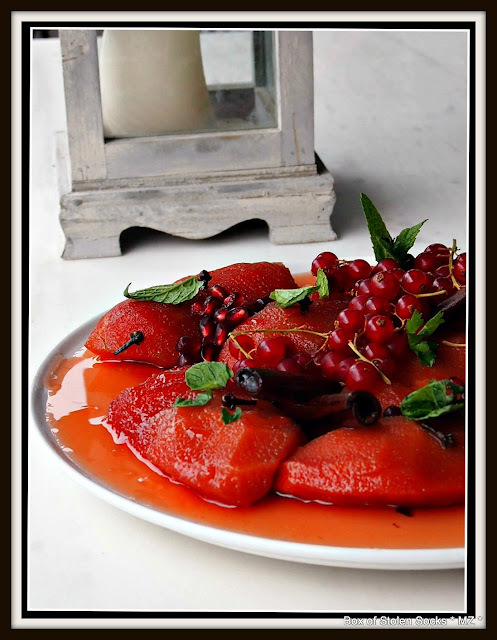 The texture of the fruit is smooth and so comforting! Such a transformation from its angry, raw, astringent personality. The long and slow cooking appeases it, alleviating its harsh character; the spices, blessed by time, infuse the fruit with sweet, soothing, aromas and flavours. In less than 90 minutes the perfect transformation occurs. Put the water, sugar, quince seeds (they are the ones that have all the pectin which will give us a nice light syrup), cloves and cinnamon sticks in a large, deep pan or pot (that has a cover) on medium to high heat. Add the quince. Make sure that the pot or pan is large enough so that the majority of the fruit pieces come into some contact with its bottom. Turn every piece of fruit two times and then lower the heat! Be careful, when I say low I mean low. It should be just above or the minimum possible depending on your stove!! Cover then and let them alone for about one (1) hour. Your kitchen is going to smell wonderfully! Check to see if they are done by carefully inserting a fork, if they are tender and bright red, then they are ready. If not, don't blame them; they just need some more time and maybe some warm water, if you see that they are struggling in the heat without any liquid left! After they finish their transformation in the pan they can stand on their own as the dessert du jour or accompanied with a bowl of Greek yoghurt for an even more tantalizing and refreshing flavour experience. Very very long time!! :)) but its all relatable and in a way perfectly normal to grapple with change!! This looks soo good.. Unfortunately we dont get quinces in India.. is the texture something like a pear??? I think we've all found keeping to a blogging schedule challenging at times. What's more important is that you are learning about a subject you love and living fully. 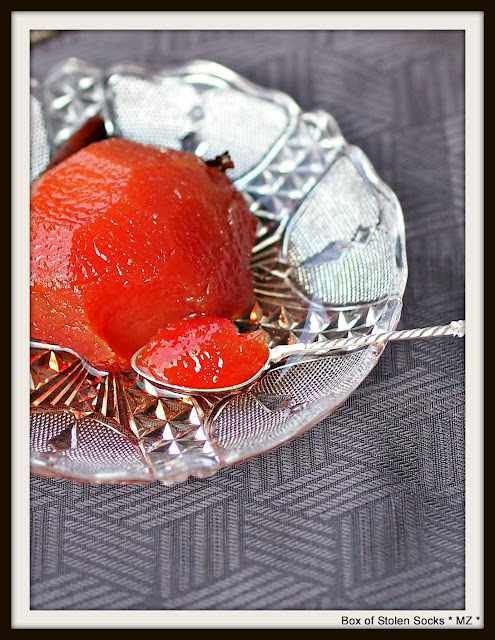 I have made quince paste before, but I don't I have ever tried them like this before. It does sound very special. You have so much going on right now - don't stress about the blogging piece. I hear you... I constantly feel like I'm battling the clock. There just isn't enough time in each day! Enjoy life, Maria! Don’t stress….things will fall into place with a little time! I haven’t had quince in years! I grew up with a quince tree in my back yard, and yearly batches of quince jam! This desserts looks so delicious…I will have to give it a try as soon as I can find some quince!